We are very pleased to announce the opening of a new modern office facility in Gatley, Manchester, following a period of growth for the company. The relocation provides us with a fantastic operational base from which to coordinate all business activity, and is funded by significant investment as we accommodate a growing demand for our services. The offices have been carefully designed to enable our sales and service teams to work even more closely, aided by substantial upgrades of both our IT equipment and telephony. Home to Andrews Air Conditioning & Refrigeration, the building will also act as a contact centre and major accounts hub for Andrews Sykes Hire. And, as you might expect from a company that prides itself on providing the country’s most advanced air conditioning systems, all office interiors are kitted out with the best cooling units on the market! Featuring industry-leading heat pump technology, our air conditioning systems use the latest R32 refrigerant to maximise performance and efficiency, with built-in motion detectors for automatic shutdown when rooms are left unoccupied. 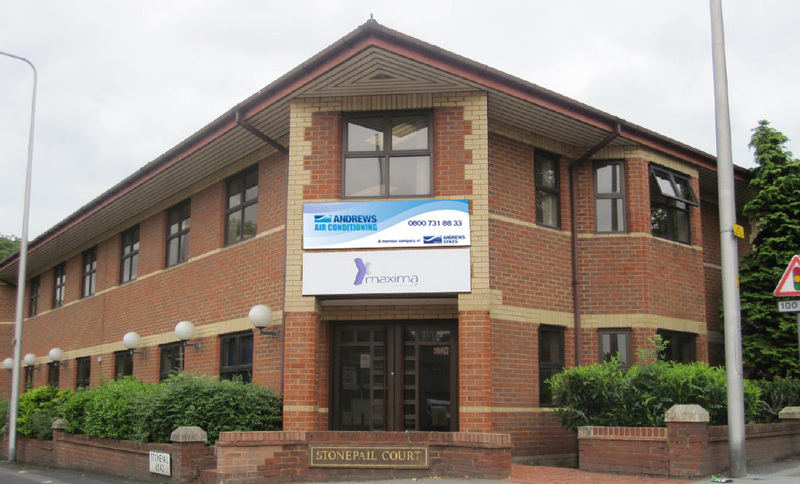 Strategically located near a number of major road links including the M60 and M62 motorways, our Stonepail Court offices are situated just seven miles from Manchester city centre. Our new address is incredibly accessible for both staff and customer convenience – a five-minute walk from the nearest train station and a ten-minute drive from Manchester airport. We are excited to unveil this new facility and look forward to handling all enquiries from a more centralised location. For more information on how Andrews Air Conditioning and Refrigeration can assist you, call us today on 0800 731 88 33. This article was posted in Andrews Air Conditioning, Andrews Air Conditioning Services, Andrews Sykes Group Plc, News and tagged Andrews Air Conditioning & Refrigeration, Andrews Sykes, Gatley, Manchester. Both comments and trackbacks are closed.